Home > Lifestyle > Can Guys and Girls Just be Friends? It’s the question that’s been asked since the beginning of time: “can guys and girls just be friends?” But who really knows the answer? It seems like we go round in circles, one side of the fence proclaiming it’s totally possible while the other side frantically shaking their heads ‘no’ in unison- almost in a panic! So what’s the answer? The best answer to give….. It’s complicated. Someone is going to catch feelings at one point or another. It’s ALMOST inevitable. Sure, there’s an odd situation every here and there where a guy and a girl never even think about their friend in a romantic way, but the majority of the time it just happens. You might not even be expecting it. It may come completely out of the blue and leave you with thoughts of confusion. But, at one point or another, one of you is going to develop feelings for the other. And that’s totally okay. Being friends, you get to see all of their flaws and all of their best traits. The two of you can have so much fun together and there’s no awkward or sexual tension. Who wouldn’t fall in love? It may be the girl who falls first, or the guy- there’s really no telling. And if the two of you happen to fall for each other at the exact same time, you may be in for one of the best relationships of your life- just saying! This is where honesty is SO important. Just like any friendship, there should always be honesty. If you start feeling like you may have a crush on your friend, then you NEED to tell them, and make a decision at that point. Do you need a little bit of space from them so the feelings can subside? Do you need to end the friendship before it becomes disastrous? Or do they just so happen to feel the same way, propelling the two of you into a beautiful and amazing boyfriend and girlfriend relationship? Either way, keeping secrets in any friendship is never a good idea. And while you might not want to end your friendship, you’ll only find yourself more and more hurt as the person you’re falling for only wants to remain friends. There WILL be jealousy. And you CANNOT tell me otherwise. As females, even if another man or woman comes around our best FEMALE friend, we get jealous. We start getting mad that they’re taking our besty away, and that we don’t have as much time to spend together. Well, same thing happens with our guy friends. They start dating someone and suddenly don’t talk as much, don’t hang out as much, and always have this new chick hanging around. It’s normal, but it may cause a bit of confusion. You might start wondering if you like your guy friend as “more than a friend”, but the answer is almost always no. It’s just in our nature to be protective of our friends! So how can you just be friends? With so much confusion and so many potential problems, how can a man and a woman really be “just friends”? -There’s no physical attraction. I mean, come on. When you’re not physically attracted to someone, you’re usually not trying to get in their pants- let alone start a relationship with them. However, for some individuals, even though the physical attraction may not be there, they might start to fall for someone’s personality. Which, of course, it a potential breach in the guy and girl friend zone. But most of the time, finding someone you’re not attracted to will help the friendly relationship last. –You’re both in a relationship. Yes, I understand that even though someone is in a committed relationship they can still breakup and fall for someone else. HOWEVER, fi you both are in a very secure and happy relationship and have absolutely no intention of meeting someone else to date, then you may very well be setting up a great friend relationship. -You’re both on the same page. This is CRUCIAL. If one of you is seeking a potential relationship and the other isn’t, this could obviously end in tragedy. Both of you need to be on the same page from the very beginning: friends and NOTHING else. If anything changes, the relationship should end completely and immediately. -There’s just no romantic spark. And yeah, this can totally happen. You can click with someone in EVERY area except sexually, and what does that leave you with? A really awesome friendship that can last, well, forever! So, can guys and girls just be friends? Although some people won’t agree with me, I have to say the answer is yes- but the chances of the friendship lasting longterm is slim, as there’s so many potential pitfalls in place. Have you ever had a best friend of the opposite gender? I totally agree with you, I wish I can stop seeing him but I don’t really have a choice. I work for his mom and it hurts seeing his face everyday because I thought the connection was there but I was wrong. That sounds like a terrible situation to be in. Perhaps it will get easier over time–at any rate, it has to get better because you have figure out something unless you want to leave your job. I hope that everything works out for you, Denishia. Good luck! I would stop hanging out with him so much. He seems like a bit of a jerk to kiss you, flirt and then tell your friends that he finds you to be disgusting. Other than being a terrible human, he also seems like he is not a particularly good friend. You should stop hanging out with him as much as possible. Since you probably do not want to tell him why you no longer want to spend time together, you may want to still hang out if he is in a group of friends. Otherwise, it looks like he has shown his true colors and is not nearly as good of a person as you thought that he was. I love it. I was hoping someone shared my views. Thank you for commenting! I am glad to hear that you enjoyed the article! Let me know if there are any other topics that you would like to see on Her Interest! I am glad that you enjoyed it. Thanks for commenting! I’m totally going to say yes! I have at least three friends who are male and I’m extremely close with them. However, I have another guy friend who I have a little crush in. But now, whenever I tell my friends who I’m texting, if they find out it’s a guy, they think we’re dating. And trust me, it gets annoying really quick. Guys and girls can be friends with each other, and they don’t have to like each other. Being friends with the opposite gender sets up this huge stereotype where you’ll automatically start to date that person, but that just isn’t the case. I’ve been waiting for someone to post an article like this, and for that, I praise you. Confidence is key, as the old saying goes. With confidence comes flirtation. So, to focus on confidence, the first thing that you need to realize is that nothing bad can happen as a result of you speaking your mind. You will not get hurt unless you make the decision to allow rejection to hurt you. Speak your mind honestly and directly at all times. Never lie and tell half truths. Stand with a strong posture before your discussions as it will automatically force your mind into a more positive mindset. If you are attempting to establish relationships with two separate people at the same time, then you should treat them with the honesty and respect that you would demand for yourself. Tell them both that you are looking into a relationship with someone else as well. If they accept your position, then you know that they will be respectful to you as you are respectful to them. Choose one and focus on that person. Do not concern yourself with looks or other shallow concepts, instead focus on their intelligence and emotional connections that they have with you. Enjoy life, and be sure to prioritize correctly. Yeah then how would people get true love? If you go blind dates, you don’t understand the person well as you only met him or her a few times. Btw,welcome. Hehe.. That’s so lucky for you! hope I meet my ideal when I am at around in the twenties! I know–I really lucked out with him. 🙂 I am sure you will find someone, you have plenty of time! Yes, of course. I’m sure everyone has at least one with opposite gender then how do you get love? You don’t always set someone up using blind date right? 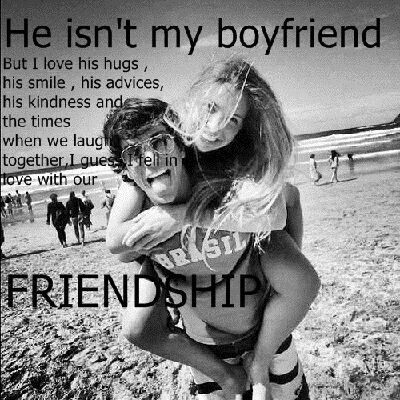 At first it will be just friends but if you two grow closer, it will be definitely more than friends relationship. Is that right? If everyone in the world does not have one there will be no teamwork between mixed genders too. I think that you have made some very excellent points, Sungyu. There is nothing stopping guys and girls from being friends, and it a great way to see if two people are compatible enough to date. Thanks for commenting! No worries! I can still see it!